Everyone is catching up from the holidays: Baker Hughes released its weekly rig count from last week today. The count showed U.S. rigs down 29 to 1,811. 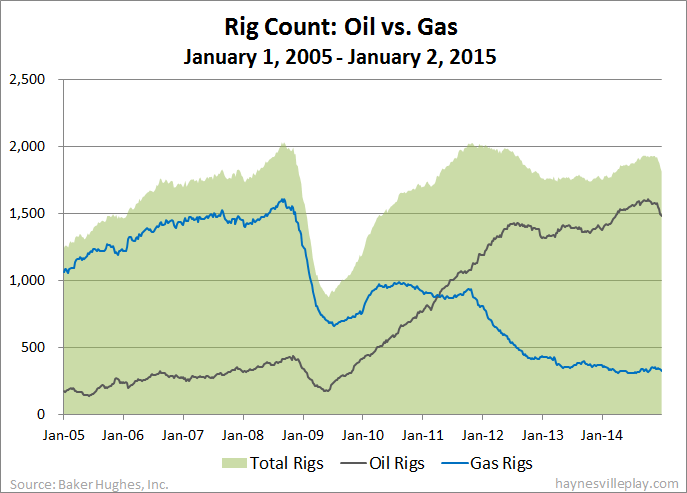 Unsurprisingly, the total U.S. rig count has dropped by 109 over the past four weeks. For the week, oil rigs were down 17 to 1,482, gas rigs were down 12 to 328 and miscellaneous rigs were unchanged at one. By type, horizontal rigs were down 14 to 1,336, vertical rigs were down nine to 300 and directional rigs were down six to 175. Among gas rigs, horizontal rigs were down seven to 246, directional rigs were down two to 54 and vertical rigs were down three to 28.